They flew on an airplane all day and night and then had to take a boat down a wide river. Jeffrey saw crocodiles and hippos in the water and all sorts of birds and butterflies. The boat pulled up to a small wooden dock and after Jeffrey and his father climbed out, they had to walk through the jungle. “We caught toucans the last time we came. This time we're here to find monkeys,” Father said. Father stopped and looked up. 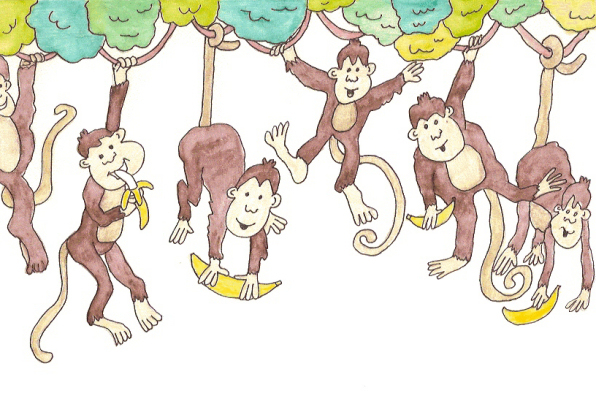 Several monkeys played in the trees, swinging from vines and eating bananas. He ordered his helpers to catch as many as they could. An hour later six monkeys sat in cages. Jeffrey talked to them and smiled at them. He handed them bits of banana. One day Father woke Jeffrey up. “Get dressed. I've got a surprise for you.” He took Jeffrey down to the zoo. “Where are we going, Father?” Jeffrey saw the elephants and lions and snakes. All six of the monkeys hung on bars, playing and having fun. 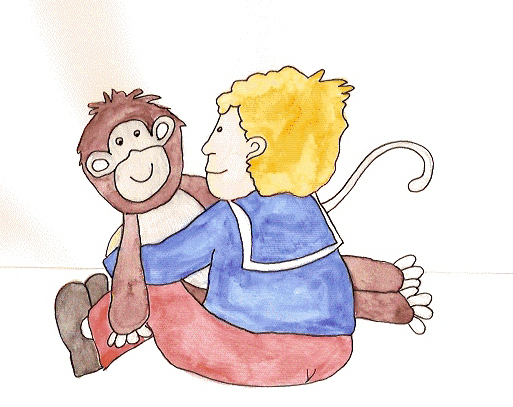 “The monkeys!” Jeffrey played with them and cuddled them and fed them oranges and bananas and coconuts.